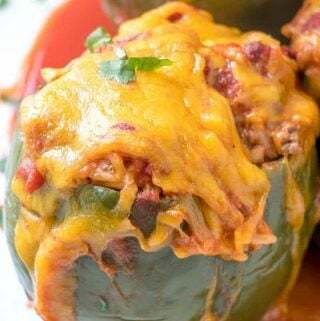 Easy, filling and delicious these Stuffed Green Peppers are a simple supper recipe that uses minimal ingredients and gets on the dinner table fast! Slice tops off of your peppers and remove seeds and membranes. In large pot, fill with water, add your peppers and bring to a boil and boil for about 5 minutes. Remove with thongs and set aside. In large saute pan brown your ground beef until no longer pink, drain. Stir in cooked rice, 1/2 can tomato sauce, 1 cup cheese, minced onion, salt and pepper until combined and cheese is melted. Add peppers to a baking dish and stuff evenly with mixture. Pour remaining tomato sauce over tops of peppers and bake in oven for 15 minutes. Remove from oven and sprinkle with remaining 1/2 cup cheese and return to oven for about 5 minutes until cheese is melted and starting to brown.